Gentle Readers, I usually stay away from controversial topics like religion and politics, but November 10th is a day I cannot ignore. The year was 1483, and in the town of Eisleben, Saxony, part of the Holy Roman Empire, the Father of Reformation was born. Martin Luther (10 November 1483 – 18 February 1546) was the eldest child and his father had big plans for his heir. After following his father’s plan all the way up to enrolling in Law school in 1505, but quickly dropped out. He began a philosophical journey that led eventually to the clergy. He was a vehement about questioning the Pope’s role and authority, treating the Bible itself as the only true guidance from God. He also denied that Heaven is obtained by performing good deeds. Luther taught that salvation is a free gift from God, through Jesus Christ, that one only has to accept. His criticism of the Catholic Church led to his excommunication. He was also branded an outlaw of the empire. Though I am not particular religious, some of Luther’s teachings ring true with me. His principle of “Justification by Faith Alone”, to me, is something so many people could be served to think about. I don’t feel that one can “buy” their way into any sort of heaven, paradise, nirvana, etc. The afterlife, which sometimes I question myself still, is either there or it isn’t. I don’t claim to have the answers, which I don’t think Luther thought he had all the answers either. I just am not sure that where anything divine is concerned, mere mortals can get it 100% correct. IF there is a great architect to this universe, I don’t think we would be able to comprehend the intellect that orchestrated all that is, was, or ever will be. When I was younger I questioned a Southern Baptist preacher on the interpretation of a passage in the Bible. I was looking at the section in its entirety, where only a small verse was used as part of the sermon. I had not intended to offend the older man, I simply had questions. His denial to engage in any sort of debate and subsequent shunning sparked my jaded view of Christianity. I want to be clear that I believe very much in many of the teachings of Christianity. There are great morals and lessons to be learned. I just abhor the way the Bible has been disassembled and twisted to serve whatever “righteous” cause is trying to wield oversight over another person’s life. The hypocrisy has caused my own break with organized religion in many ways as I have grown older. 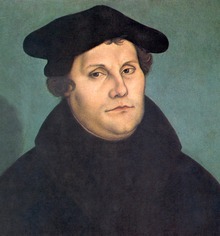 This entry was posted in On This Day in Literary History and tagged justification by faith alone, martin Luther, On this day in literary history, reformation, religion, writer. Bookmark the permalink.